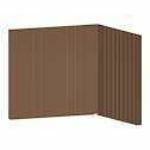 Description: 2" deep, extruded aluminum visual screening with airflow. 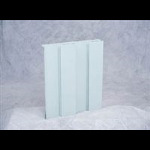 Low profile rear supports for attractive appearance. 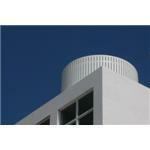 Front and back blade edges overlap for complete visual screening. 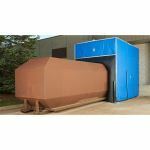 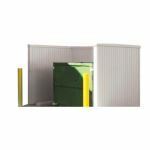 Description: The Zoneworks® Compactor Enclosure provides an environmental control solution for trash compactors and dumpsters. 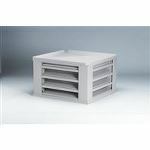 Description: Architectural metal panels and light-gauge framing components for installation on concrete or asphalt pad. 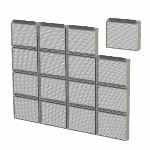 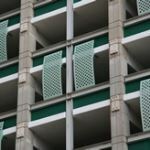 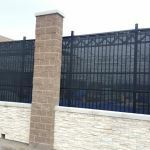 Description: Perforated metal is the ideal material to screen mechanicals, transition dissimilar buildings, hide unsightly areas, and beautify a plain structure while providing airflow and visual interest. 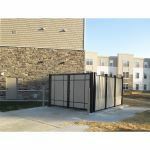 Description: Custom screens produced to meet customer’s needs to block the amount of wind coming through their property. 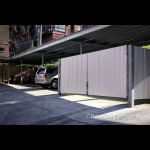 Also used for privacy screening. 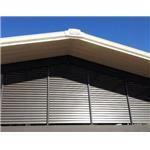 Manufacturer: Willard Shutter Company Inc. 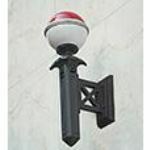 Manufacturer: J.C. MacElroy Company, Inc.